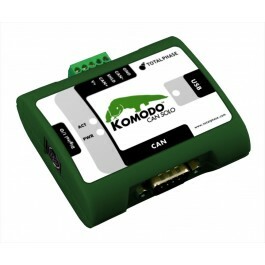 The Komodo™ CAN Solo Interface is a powerful USB-to-CAN adapter and analyzer. The Komodo interface is an all-in-one tool capable of active CAN data transmission as well as non-intrusive CAN bus monitoring. The portable and durable Komodo interface easily integrates into end-user systems. It provides a flexible and scalable solution for a variety of applications including automotive, military, industrial, medical, and more. The Komodo CAN Solo Interface features a royalty-free API, and cross-platform support for Windows, Linux, and Mac OS X. If you are new to CAN, the CAN/I2C Activity Board Pro is an affordable tool to help get you started. Purchase this board together with the Komodo CAN Solo Interface and you'll receive a 20% discount off the price of the CAN/I2C Activity Board Pro. Detailed technical information about the Komodo CAN Solo Interface can be found in the User Manual. Configure the Komodo CAN Solo interface as either an adapter or a non-intrusive analyzer. The Komodo CAN Solo Interface can operate as a CAN node, to send and receive messages. Communicate with any type of CAN network, from automotive systems to industrial controls. The Komodo interface operates at up to a maximum bitrate of 1 Mbps. Non-intrusively monitor a CAN bus and see the data as it is captured. The Komodo interface is independently, galvanically isolated and can capture CAN data at up to 1 Mbps. The 8 GPIO pins can be configured for input or output, allowing the Komodo interface to communicate with external logic. The Komodo CAN Solo Interface is rated for operating temperatures from -40°C to +85°C (non-condensing). The Komodo CAN Solo Interface comes complete with a royalty-free API. Less time wasted because developers do not have to share tools or go to the lab to debug simple problems. Less wasted time means higher productivity because developers can identify and fix problems quickly and easily with less down-time. Higher productivity means shorter development cycles. Projects get done on time and on budget. By saving just a few hours of engineering time, the Komodo CAN Solo Interface will have paid for itself. The Komodo interface is completely field-upgradable via USB. Total Phase is committed to improving the Komodo interface and making these improvements available to our customers. You will never have to worry about being out of step with the latest software features. Eligible software and firmware upgrades are always freely available in the Downloads section of this website. What is the Best Software to Use with the Komodo CAN Solo Interface to Read Complete Data? How Are Transactions Timestamped and What Is the Unit of Measurement for the Komodo CAN Solo Interface? How Do I Connect the Signals from an Automobile Radio to a Komodo CAN Solo Interface? How do I set up the Komodo CAN Solo Interface to send or receive RTR frames with a device on the CAN bus? Which Komodo CAN Interface and Which Software Package Best Supports the Simultaneous Execution of Commands from Different Threads? Question of the Week: What are the features of the Komodo CAN interface and the software used with it? Support Question of the Week: How do I use the Data Center Software with the Komodo CAN Interface to Generate and Capture CAN Bus statistics?